Hi everybody! Sorry it's been a little while. I hate to use this as an excuse for my recent absence, but this past month brought with it a pretty severe case of writer's block. Despite many attempts at remedying this all-too-common ailment through long walks and binge watching Friday Night Lights, I just couldn't put words to the page. Instead of beating myself up about it, which never does any good, I decided to channel my energy into other outlets like reading this new release and this classic. Taking food fueled trips to Ann Arbor, Madison, & NYC. And, of course, cooking lots of new recipes like this cauliflower cake, this farro and mushroom soup, this apple galette, and too many batches of these brown butter blondies. The real stand out of the lineup though has to be this caramelized fennel and herbed polenta recipe from the My New Roots cookbook, which I originally discovered via Heidi Swanson's blog, 101 Cookbooks. The dish is so simple and quick, but satisfies like a stew or roast that has been cooking away all day. Its a real stick to your ribs meal, which, despite a suspicious string of 60 degree days here in Chicago, is the type of meal I instinctively crave come November. If you think that you aren't a fan of fennel, I beg you to reconsider. What comes off as fairly bitter and black licoricey in flavor when raw, transforms into something sublimely buttery and sweet when cooked. Combined with creamy polenta speckled with bright herbs and loads of parmesan cheese, you can't really ask for a more satisfying, cheap, and, honestly, really-good-for-you lunch or dinner. I'd recommend pairing with a good read, the calming jazz sounds of Cecile McLorin Salvant (my newest music discovery courtesy of Terry Gross) and a big mug of tea. While this dish does take some time and elbow grease to come together, most of the ingredients are probably already tucked away in your refrigerator/cupboard. Ideal circumstances in my book. Heat the vegetable broth in a large saucepan until simmering. Slowly pour in the polenta in a steady stream, whisking all the while to prevent clumping. Add a few pinches of salt. Stir constantly for a couple minutes and then reduce the heat and simmer, stirring every 5 minutes or so, for 30-45 minutes. If the polenta becomes too thick, add more broth and whisk until smooth. While the polenta is cooking, cut the fennel bulb into thin vertical slices about 1/4in thick, orienting the slices from the top of the bulb. Heat the clarified butter in a large skillet on medium-high heat. Add the fennel slices to the skillet, arranging them in one layer so that they all come into contact with the surface (not overlapping). Sprinkle with sea salt. Do not stir or move the fennel until it is golden on the bottom, 5-7 minutes. When all the pieces have browned, flip them onto the uncooked sides. When the underside has also browned, add a sprinkling of fennel seeds and the maple syrup, and let cook for 1 minute. Toss to coat. Season with more salt if needed. Add the chopped herbs and grated cheese to the polenta, and give it a final stir. Whisk in a little more broth or water if too thick. 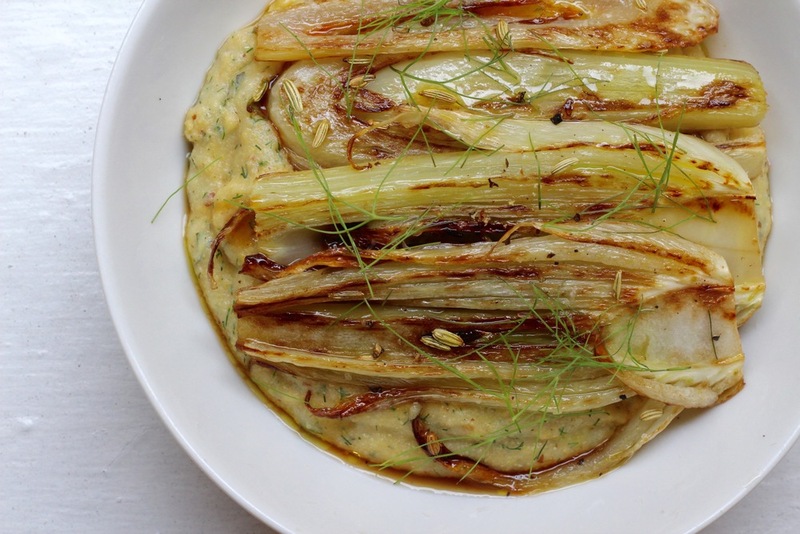 To serve, scoop a portion of polenta into a bowl and arrange the caramelized fennel on top. Add a drizzle of olive oil and garnish with fennel fronds.